You can chat with us during office hours using the widget in the bottom right corner of your screen (on this page only). You will automatically receive occasional email announcements from Gompa if you have created an account. Mailings are sent to the email address you use for your Gompa account. Please adjust your spam / junk mail filters to accept mail from mail[at]gompaservices.com. 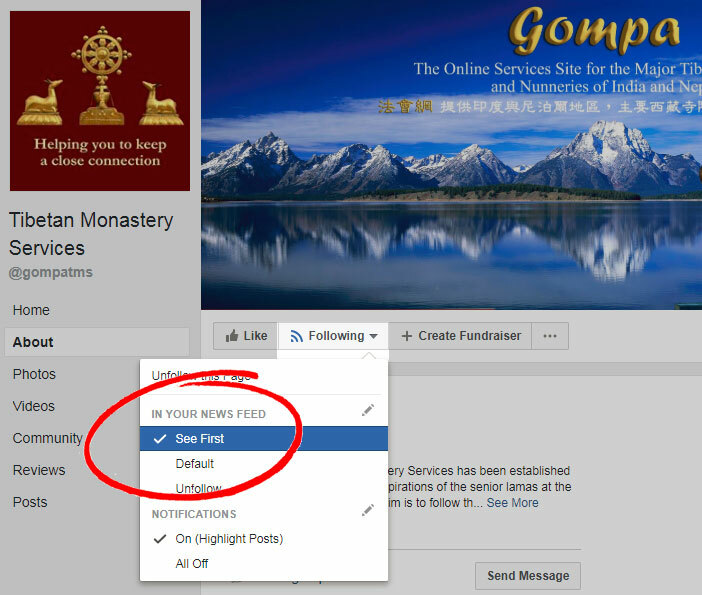 To create a Gompa account please select New to Gompa. Please be aware that because of the large number of teachings and other events at the partner monasteries and nunneries, only selected events are announced via email. To stay informed about all Gompa news and special event announcements, please refer to the Following Gompa on Facebook section, below. We use Constant Contact to manage our email announcements of selected teachings and special event webcasts, and for other Gompa news. You may unsubscribe from this service at any time. For information about how to unsubscribe please select unsubscribe. If you have unsubscribed from this service and you wish to re-subscribe and resume receiving mailings from Gompa please select re-subscribe. All event webcast announcements, and other news items, are posted on our Facebook page. Note: if you 'Follow' our Facebook page and you want to be sure to see all of Gompa's event announcements, please consider specifying our posts as See First in the 'Following' tab.